This section provides overview maps of distribution of the major Soil Orders, based on the Australian Soil Classification, in the West Gippsland region. These broadscale maps should only be used as a general indication of the distribution of these Soil Orders. More detailed soil/landform mapping at 1:100 000 scale is provided elsewhere on this site. Soils developed on rolling to steep hills on Palaeozoic (Devonian and Silurian) sediments are generally Yellow and Brown Kurosols as well as Tenosols. They are usually strongly acid throughout and occur on steep slopes with weathered parent material usually encountered above 1 metre depth. These areas are mainly forested foothills and slopes of the highlands. Much of these areas are publicly owned and in water catchment areas. Some parts are cleared for pasture. The Strzelecki’s are a range of low hills formed by uplift of Cretaceous sediments. These uplands are strongly dissected with moderate (10-32%) to steep (32-56%) slopes. The soils developed on these hills are typically Brown and Grey Dermosols and are characterised by a lack of strong texture contrast. They are strongly acid throughout the profile. Weathered bedrock usually occurs before 1 metre depth. On the steeper slopes, less well developed soils (Tenosols) can occur. As the erosion rates are high on the steeply sloping land, the Strzelecki soils are considered to be relatively young. This landscape originally supported a dense forest. Tunnel erosion is a hazard associated with vegetation clearing on the steep slopes. Grazing (beef and dairy), hardwood and pine forestry are the dominant land uses associated with these soils, although some cropping occurs on less steep land. Parts of an earlier land surface remain on the down-throw sides of the Bass Fault, particularly on the Heath Hill Block. The slopes here are more gentle (3-10%) and the soils on Cretaceous sediments are older and have marked texture contrast between the surface and subsoil. These Kurosols are generally strongly acid throughout and are less fertile than the Dermosols – originally supporting a more open forest. Cretaceous sediments in road cutting. Deep red friable soils have formed on Tertiary basalts (commonly called Older Volcanics) and are associated with rolling hills in the Warragul and Thorpdale regions where dairying and horticulture (mainly potato cropping) are major industries. These Red Ferrosols are generally strongly acidic throughout, lack strong texture contrast and are high in free iron oxide. A diversity of soils has developed on Tertiary sedimentary deposits. During the late Tertiary there was significant movement along structures that had been active in the early Tertiary. It was also at this time that the Eastern Highlands reached their maximum height. 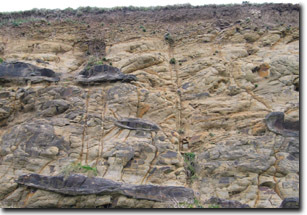 Accelerated erosion of the highlands occurred and there was extensive sediment deposition, often covering the Cretaceous sediments. The Tertiary sediments north of the Strzelecki’s were deposited as fans and aprons of gravel, sand and clay. In the western part of the region (Warragul district) the soils are typically Yellow and Grey Dermosols. They generally lack strong texture contrast between the surface and subsoil horizons and are acidic throughout the profile. Below the clayey subsoil, the underlying material is quite variable and ranges from sandy clays to cemented sands and gravels. In the eastern part of the region (lower rainfall zone), a stronger texture contrast is evident and the subsoils are often sodic. These soils are commonly Brown and Yellow Sodosols. Soils in the Tarwin Sunklands in southern Gippsland are also more likely to be texture contrast soils. In some areas a zone of variably cemented iron and organic matter compounds, known as ‘coffee rock’, may also occur below the bleached subsurface horizon at about 40-50 cm. These are known as Podosols. Soils developed on Pleistocene and recent sediments are usually associated with alluvial plains and valley floors and these occur throughout the region. The most extensive alluvial plains deposited during the Pleistocene Period occur east of Traralgon, north of the La Trobe River and around Yarram. The soils on the oldest alluvial plains are mostly Brown and Yellow Sodosols. These soils are characterised by a strong texture contrast between the surface and subsoil horizons and the subsoil is sodic. Remnants of former stream courses, called prior streams, are still obvious on the youngest Pleistocene alluvial plains around Maffra and Sale. The soils here may or may not have strong texture contrast and are generally Red and Brown Dermosols, Sodosols and Chromosols. The soils are mostly irrigated. Black Dermosols have developed on Recent floodplain sediments in the Maffra region. They lack strong texture contrast and are well structured and permeable. Many of the soils in the valley floors in the Warragul region are Hydrosols which tend to be saturated for a number of months in most years. Along parts of the coastline, siliceous sands have been deposited by wind during the Holocene period. Typically, Podosols have developed in these areas. These sandy soils are strongly acidic and have accumulations of 'coffee rock' in the subsoil.